Ten years ago, London-based designer Ran Merkazy starting an unusual project. He started designing a better colander. Inspired by geometry and origami, Merkazy eventually came up with a folding, hanging, pouring, steaming, straining device that your kitchen needs. The RMDLO Colander is about to reach its goal on Kickstarter, and we pray this pretty little thing makes it to market soon. Made up of several stainless steel strips that fan out into a bowl shape with handles on either end and collapse into a 1.6-centimeter-thick band that can hang on the wall like a ladle, the utensil is just plain useful. 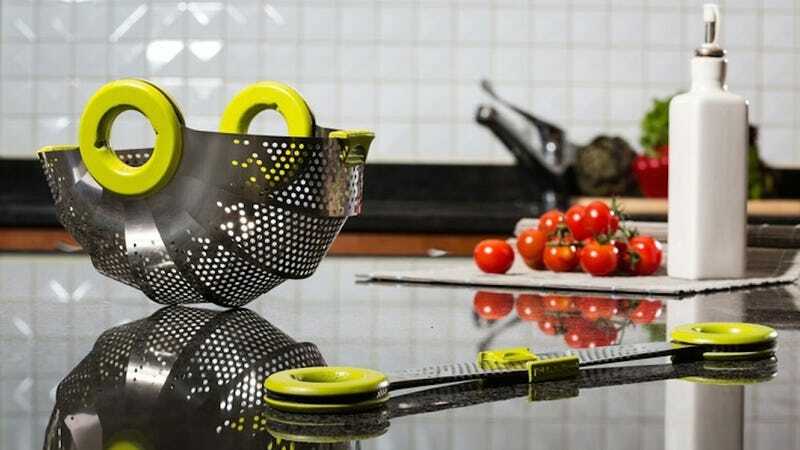 If you squeeze the two handles together while it's in bowl-form, the colander turns into a perfect shape for pouring.